This post is otherwise known as ‘getting a bit further beyond trial and error’! Whenever I sit down to start shaping part of an amigurumi figure, there is always a certain amount of undoing and re-doing that goes on. I have in mind the shape I am trying to achieve, but there is often more luck than judgement involved as to whether it will turn out as I expected on the first attempt, and sometimes even the second, or third…. 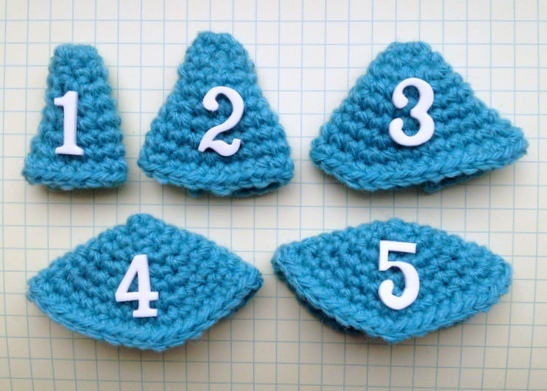 The basic technical points are these, as will be familiar to anyone who has done a little amigurumi-type crochet. 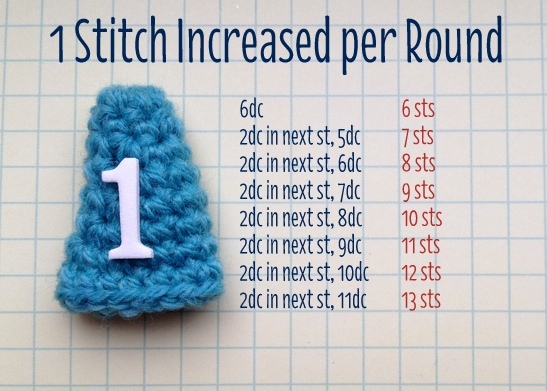 If you start working in the round with double crochet (US single crochet), and increase by 6 stitches evenly every round, then you will end up with a flat circle. If you start with 6 stitches and work evenly on those 6 stitches without any increasing or decreasing, you will have a tube. 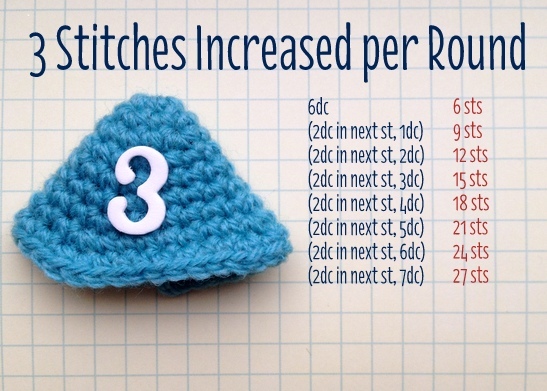 In between those two extremes, if you increase by the same number of stitches every round, choosing a number between 1 and 5, you will get a cone. 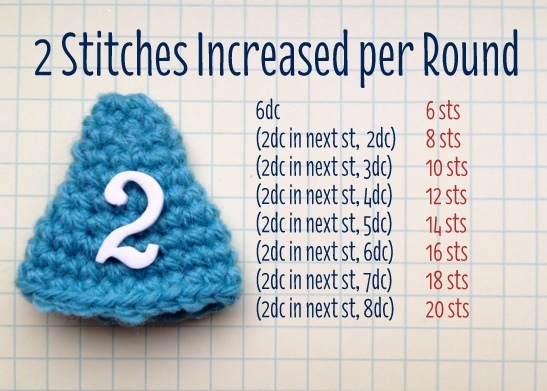 So if you increase by only 1 stitch every round you will get a narrower cone (closer to the tube), and if you increase by 5 stitches every round you will get a much wider cone (closer to the flat circle). If you need to brush up on the basics, try this Basic Guide to Amigurumi Part 1, and Basic Guide to Amigurumi Part 2. 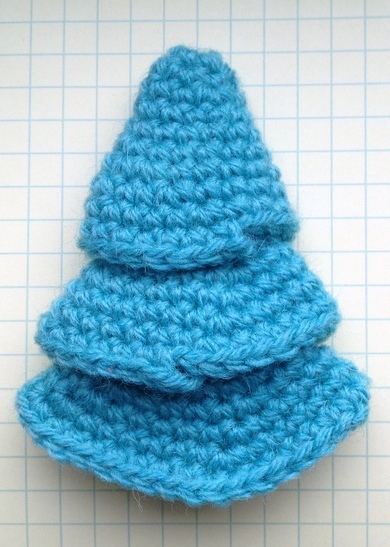 I know this in theory, but what I want to be able to do is to visualise what a ‘1-stitch’ cone looks like, and what a ‘3-stitch’ cone looks like. In my mind they always translate into various kinds of hat, as that is often what I am making when I want to form a cone! Is this a wizard hat (narrow and pointy), a gnome hat (slightly less pointy), or an Asian-style rice hat (altogether much flatter)? Now this isn’t rocket science, but it occurred to me that if I make versions of all these cones then I can use them for reference later, and I will be able to judge what kind of gradient each number of increases will give me. For each cone I worked 8 rounds. For the 1-stitch cone I started with 6 sts into a magic loop. You could always start with fewer stitches than this for a more pointy-ended cone, but any fewer than 4 is tricky to work with. Each round is listed on the picture, with the total number of stitches at the end of the round in red. These are the three I think I would use most often for ‘hat-type’ shapes, so these are the ones I have written out in full. Here are all the cones from 1-stitch to 5-stitch together. Looking at the gradients for the larger cones could help in trying to judge increases on more complicated shapes, even if they weren’t used as often as cones. A note about the 4-stitch and 5-stitch cones; it’s difficult to start a 4-stitch and a 5-stitch increase round from a base of 6 sts, as I used for the others. Guess what? Start with 4 stitches in the first round of the 4-stitch cone and 5 stitches for the first round of the 5-stitch cone. Easy! And finally, this is what happens when you start playing around! My son picked up 2, 3 and 4 and put them inside one another. The beginnings of a Christmas tree, perhaps?